As if the sheer horror of lost luggage isn't enough incentive for families to pack carry-on luggage only, now nearly all airlines are charging checked baggage fees. How to avoid them? 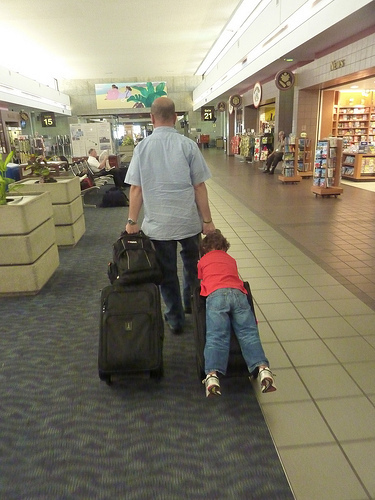 Fly carry-on only... yes, even with kids. Rolling clothes instead of folding them saves 30 percent more space in a duffle or suitcase. Line the bag with bulkier items such as shoes, then roll heavier clothing (like pants and jeans) on the bottom, layering next with shirts, t-shirts, and lastly, delicates and socks. Or, use packing cubes. Think they're just for dorky business travelers? Think again! Packing cubes can be essential to packing organization. I use shoe cubes to keep kids' socks and underwear organized, but many families 'cube' by day, packing complete outfits for each child in each cube. Assuming your family vacation is not taking you anywhere too extreme, the majority of messes will occur to your child's shirts (think food spills, sweat, and sticky hands wiping). Pants and shorts can often be re-worn with minimal notice to their wear. Try to find clothes that do double duty, such as pants that zip off to become shorts, and sun protection shirts that can be worn during active play. Likewise, try to restrict each child to two pairs of shoes: a sturdy pair of walking/hiking shoes (to be worn on the plane) and a pair of destination and season-appropriate sandals or boots. No one wants to do laundry on vacation, but with a little preparation, it doesn't have to ruin your day. We always pack 2-3 mesh laundry bags, which compact to almost nothing while empty. Travel-sized laundry detergent containers and stain remover can be purchased in TSA-approved sizing, and a roll of quarters can make finding change for washing machines far less painful. In addition to each ticketed passenger's carry-on, he or she is permitted a personal purse, tote, or backpack. 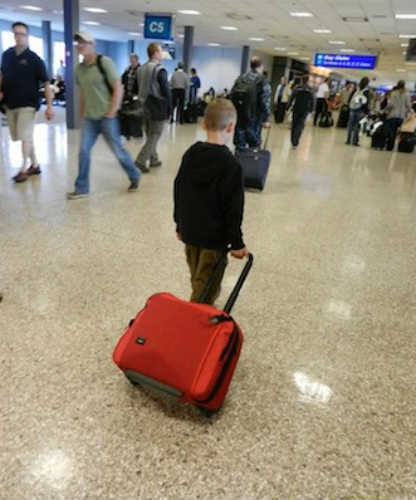 By outfitting each child with carry-on rolling luggage that fits in a plane's overhead bin, he or she is entitled to a backpack that fits under the seat. We designate one for in-air entertainment, which carries our laptop, iPad, and each family member's book or Kindle and one backpack for snacks, medications, water bottles (to be filled post-security) and other essentials. Because so many travelers are now packing carry-on only to avoid luggage fees, those bulk-head luggage bins fill up quickly. And when they're full, you'll be forced to check bags against your will. If you're carting several carry-on roller boards or duffles, board the plane as soon as you're able. Doing so will ensure there's still space for your carry-ons. If you're carrying-on only for the cost-savings, and don't mind waiting at the baggage carousel for your bags at your destination, almost all airlines will offer free checking at the gate, as an incentive for travelers to save some cabin space. On smaller commuter flights, gate-checked bags will usually be waiting for you on a cart directly off the plane. Avoiding checked bag fees is almost always possible, with a few exceptions. You may not be able to fly carry-on only with kids 1) during winter vacations, for which bulky snow or ski wear or multiple layers are needed, or 2) during adventure travel, during which a wide-variety of clothing types will be needed (think hiking gear and snorkeling gear, or 3) during multi-climate travel, during which several drastic weather changes may necessitate bringing both winter and summer wear.